Today, ceramics is considered the most common and favorite material for decorating walls in the bathroom, in the kitchen and in the bathroom. The tile is popular not only because of the rich variety of textures and colors, with which you can create unique interiors, but also because of its durability and strength. However, in some cases it becomes necessary to replace the tile: when the old coating has worn out and is not enough without repair, as well as when the owners just wanted to update the situation. In the latter case, if the tile is still in good condition, you can carefully remove the tile for re-laying in another room, for example, at the cottage. When starting the dismantling of a tile, do not rush to pick up a puncher. It is suitable only if you do not plan to keep the tile in integrity, but want to get rid of it quickly. Although, probably, it will come in handy after the removal of the tile for beating the layer on which the tile was kept. 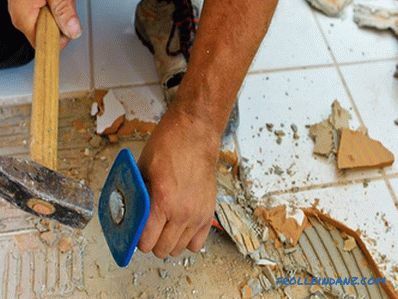 Before Getting started, it is important to know what material the old tile was laid on. 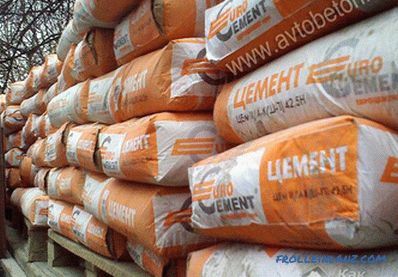 If cement mortar was used for its installation, then removing the tile without damaging it will be very problematic. Sometimes even experienced professionals are not able to solve this problem. A tile fixed to the wall with cement mortar is so firmly attached to the base that it is impossible not to split it during dismantling. This means that the percentage of damaged or broken tiles will be very high, so you should not stand on ceremony with it. Instead of vain attempts to keep the old coating, do not waste time and nerves, it is better to take a punch and walk it over the entire surface. If the tile is planted on a special tile adhesive, a more gentle dismantling would be appropriate. However, here you should not hope that you can save all 100% coverage. Even with the most careful and careful separation of the tile from the wall, it is impossible to break several pieces. 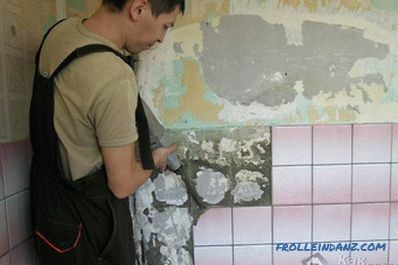 In principle, there is nothing difficult in removing the old tile. I would also like to note that the success of the enterprise depends on the quality of the tile, glue, the skill of the handler and the age of the coating. A tile laid on conscience is poorly removed - as a result, the damaged tile will come out more than suitable for re-finishing. The old coating also does not behave very well when removed - it breaks and cracks. First, you need to tune in to a long and hard work, stock up, so to speak, with patience. Then take a spatula or screwdriver and clean the tile from the decorative grout, thereby freeing the space between the seams. This is necessary so that the tile can then be gently picked up with a chisel. Analysis of an old tile always starts from the top. 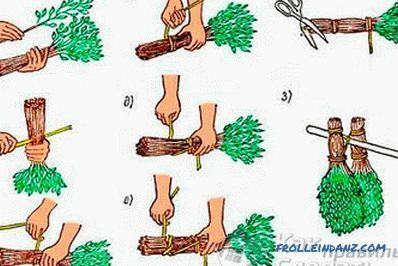 If you beat off the lower ranks first, there is a chance that the upper ones will collapse, because you do not know for sure how tightly they hang on the wall. Sometimes it happens that a tile falls off in layers . Sharp splinters can stick into an arm or leg, which is why it is important to protect yourself. Mandatory glasses and gloves. So, choosing one of the top tiles, you need to break it. 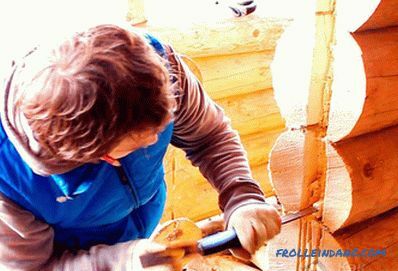 Then gently pick another tile with a chisel and hit it with a hammer. The blows should not be too strong, but sufficient for the tile to detach from the wall. Here you will need a knack, because you need to catch the tile in time so that it does not fall to the floor and break. During dismantling, when you are already striking the chisel with a hammer, carefully observe the condition of the tile. 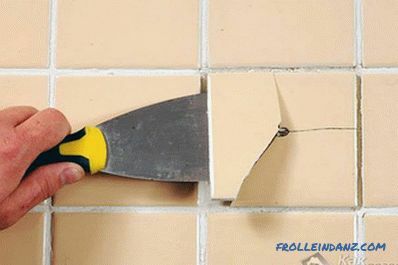 If as the chisel moves between the wall and the tile, nothing happens to the latter - it remains immovable, then, most likely, with the next blow with a hammer, it will crack. In this case, you should try to raise it on the other hand, if even then the tile does not show signs of stirring, it means that it will inevitably crack. There is nothing terrible in this, because as already noted above, it will not be possible to remove all the old tiles without damaging individual specimens. Just move on to the next one, maybe you’re lucky with it. By the way, due to the complexity of the process and the high risk of damage to most tiles Many masters do not set the task to save the coating, but simply remove it with a perforator. It is important to immediately assess how firmly the tile is glued, and also to determine the presence of so-called baying tiles - those under which the emptiness knocks. 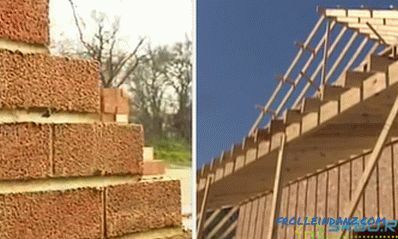 They are dangerous because during dismantling they can fall off in whole layers. If you can’t work effectively with a chisel and hammer, then you can remove the tile in the bathroom with steel wire. This will require two short pieces of thick wire that need to be bent on one side in the form of hooks. These hooks and need to hook the tile at once from both sides and pull over. 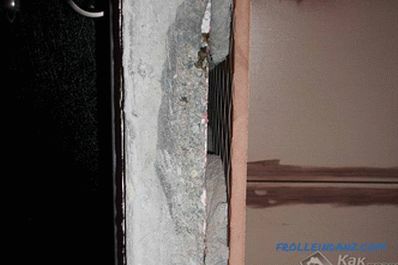 Sometimes you need to replace one or several fragments of the cladding, which for one reason or another were damaged and became unsuitable for further operation. We will not describe the possible situations that have resulted in the damage to a separate tile, we say only that it is not easy to replace it. It's not about the difficulty of removing the tile itself, but about not damaging other (good) tiles during work. The procedure is as follows: clean the seams around the damaged tile, hold the cutter on the tile so that you get two diagonal lines intersecting in the center, and then drill a hole at the intersection point of these lines. This will weaken the fastening of the tile and allow it to be beaten off with a hammer and chisel from the wall. 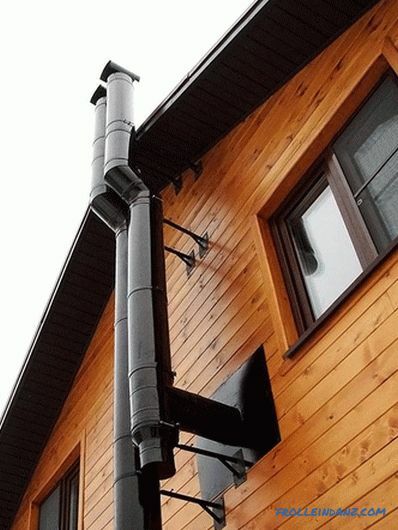 It is necessary to work with extreme caution and to avoid intense exposure to the wall, since the remaining elements of the coating may fall off. As you can see, you can dismantle the old tile yourself. It is not necessary to take up the punch and destroy everything around. 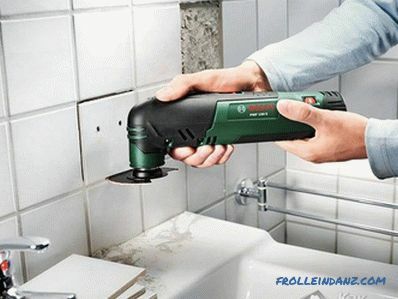 If you have a little patience and a suitable tool, you will remove the old tile without damage. Who knows, maybe you will still need it.